If you have a really low interest rate, your money can earn more for you elsewhere. If you were lucky enough to get a mortgage for 3% – 4%, then it shouldn’t be too hard for you to find an investment vehicle that can earn more than that each year. Even really safe mutual funds will do that. You are basically borrowing money from the bank to invest it somewhere else. So unless you have a really compelling reason for getting rid of the mortgage, it may be more profitable in the long run to put your extra money in stocks or mutual funds. Your mortgage is a tax shelter. All of the interest that you pay on your mortgage is tax deductible at the end of the year. So depending on how much you are paying the bank (and what tax bracket you fall into), you could be getting back thousands of dollars at the end of the year all because of your mortgage. A mortgage is better than almost all other forms of debt. If you have other forms of debt, odds are you should pay them off first. In fact, even if the interest rate is lower than your mortgage, it still may be better to focus on other loans, especially if they are much smaller than your mortgage (which most are). The reason for this is that smaller loans will get paid off quicker (for obvious reasons – they’re smaller) and open up a lot more money that you can start funneling elsewhere. There are more important places to put your money. There are quite a few places your money is better spent than paying off your mortgage. One of the most important places that is often overlooked is retirement (I’ve got a great list of 14 Different Ways to Save for Retirement if that applies to you!). Even if you are already contributing to a 401K or IRA you still may be better off putting your extra money in a long-term investment vehicle that will be saved for those golden years. College funds, emergency funds, Health Savings Accounts, and short-term savings are also worthy causes that should take precedent over your mortgage. Your home is not liquid. This is a pretty big deal. If you pay off your mortgage, you technically have hundreds of thousands in assets (or whatever your home is valued at). BUT if you can’t sell your home, then you can’t really get to that money. And even if you can sell the house, the process doesn’t happen quickly. So before you get excited about outright owning your home, make sure you’ve saved plenty in liquid assets to cover any emergencies. No matter what you decide, what is most important is that you’re happy in your home and making smart choices. Good luck! Follow my board on Pinterest for other tips on cutting costs and building wealth! Thanks for the great article. Another point- you will still always have to pay taxes and insurance- a large part of that mortgage payment. A $200k note at 4.25% on 30 yrs is roughly $1k/month in P&I. Taxes would prob be $4k/yr (I’m in Texas), pls $2k/yr for homeowners. Paying it off early would put $1000 back in your pocket every month and equity on your balance sheet, but roughly a $500 pymt for taxes and homeowners ins. that’s such a great point! and totally true. That’s something most people don’t think about when they set out to pay off the whole mortgage. Thanks for the input! While it certainly makes certain sense not to pay off your mortgage if you do have a super low interest rate and you can get a better return by investing the money, I would like to point out that “All of the interest that you pay on your mortgage is tax deductible at the end of the year” is incorrect. I see that you noted that it depends on your tax bracket but I think that a lot people don’t realize that this disclaimer means that if they cannot itemize their taxes because their standard deduction is higher than what they could itemize, then NONE of the interest paid on the mortgage will be deductible. Or if you buy a cheap enough house that the interest paid on the loan won’t amount to much. And if you accelerate your mortgage pre-payment, at some point you won’t be able to take that deduction anymore because you won’t be paying all that much interest anymore. We haven’t been able to itemize for several years, despite having several children. I have a high interest rate that I cannot reduce (long story) and we are paying extra every month to pay it off ASAP. Barring any catastrophes, we should be mortgage-free in 5 years, right as our youngest graduated from high school. Even though we could be investing this money, it’s important for me, a stay-at-home mom, to have the security of a paid-for home, in case my husband would ever lose his job or become disabled. We can scrimp on everything (and do!) but I would hate to lose the house. 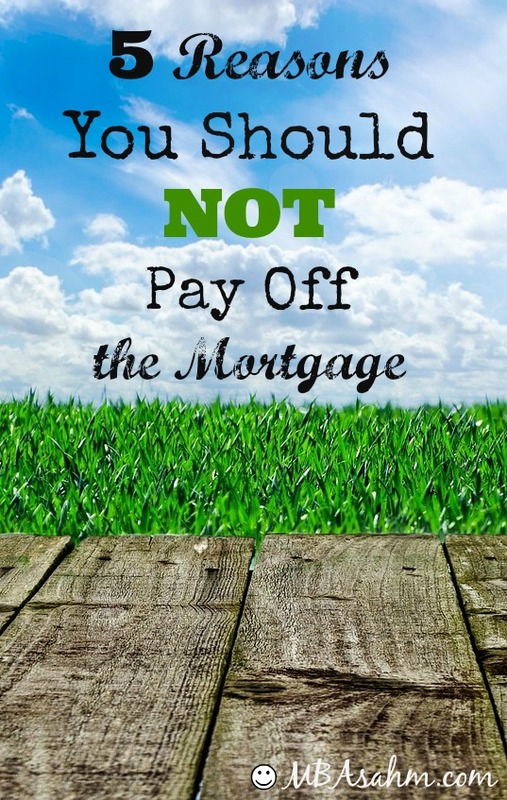 While it is great to be mortgage free, there certainly are some benefits to having one… totally agree! Thanks for linking this great money saving article up to #ShareTheWealthSunday. These are fabulous reasons to not pay off the mortgage. Thanks for sharing this on Share the Wealth Sunday. I’m going to feature this on my FB page this week because your advice is so awesome! Point 1: True. The only thing is that returns from investments are not guaranteed and there is always a risk that you could lose all your money. Point 2: Not applicable to me as I live in the UK and our tax rules are different. Certainly a consideration, though. Point 3: Agree. It’s almost always better to pay off credit cards, student loans etc. first because the interest rates are higher. Point 4: Same as point 1. I personally consider paying off the mortgage on our home an important part of saving for retirement, because it’s unlikely my husband will be able to retire until we are rid of the payment (and I’ll never get him to downsize). Point 5: Agree. You should always build up a healthy emergency fund before considering paying extra on your mortgage. I would rather have the security of being debt free as soon as possible, even if it doesn’t make sense from a purely numbers standpoint, but many others choose differently. It’s rather like the difference between the Debt Avalanche and Debt Snowball methods: the former is about numbers and the second about emotions. You have to go with the approach that makes sense for you and so gives you the best chance of success. So true, Nikki! My husband is a Financial Advisor and he is always advising people on this very topic. Thanks for sharing on Turn It Up Tuesday! I like how you looked at this from a different perspective. Thanks for posting. Hello from Totally Terrific Tuesday. This is great advice! I would still love to have that mortgage paid off though;0) I want it all! Lol! Some great advice. Paying off our mortgage when we retired (in our 50’s) though was the best thing we could have done. I’m not sure how we could have made it with a mortgage and our retirement pension. It really helped out. Great Advice! I pinned it so I can share it with my husband. Thank you. I don’t have the money to pay off my mortgage, but it’s good to know that saving is better. I always thought not having to pay a mortgage was better. You brought up some very good points.